SNES Mortal Kombat II (USA V1.0) "playaround" in 12:20.57 by Samhain-Grim. Note: The movie is rated PG-13. Like all of the Mortal Kombat games, MKII is about warriors fighting in a tournament for inspecific power and fame. 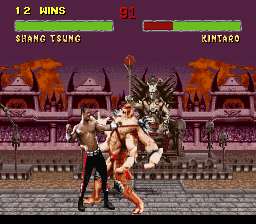 Shang Tsung is chosen for his ability to transform into every other character (except the two non-playable characters), and a different fatality is used on every level (despite the extra time that it takes to do so). The run focuses more on entertainment than finding the fastest way to win. Each round is a flawless victory, despite being hit by an attack that doesn't register any damage.